Only 50 were ever made - and one can now be yours. The Miura still stands as one of the most seminal Lamborghinis ever made, paving the way for the manufacturer to become the renowned super sports car maker it is today. Over 50 years since its debut, the Miura’s legendary looks can still turn heads today. 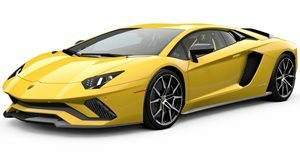 To honor its 50th anniversary last year, Lamborghini released a special edition Aventador that paid tribute to the iconic sixties sports car. Only 50 examples of the Lamborghini Aventador Miura Homage Edition were made, and most were already snapped up before it was announced. But now one of them can be yours. Spotted for sale at a Lamborghini Newport Beach dealer, this Aventador Miura Homage is finished with a ‘Blu Notte Miura Edition’ blue and silver paint job, in contrast to some of the more brash color schemes available designed to mimic the original Miura. Complimenting the elegant exterior is a black ‘Terra Emilia Leather’ interior unique to the Aventador Miura Homage, as well as silver wheels (20 inches up front, 21 in the back) matching the lower body. If this legendary Lambo tribute car wasn’t already alluring enough, it’s only clocked up 100 miles in its lifetime, so it's virtually brand new. You shouldn’t be surprised to learn, then, that the dealership requires $499,990 for you to take it away, which is around $100,000 more than a brand new Aventador with base trim. Not that this will probably matter to wealthy Lamborghini collectors, who will no doubt lap this up. Plus, it’s still considerably cheaper than an original Miura, and a lot less hassle to run.